WANT TO CHANGE THE WORLD AT WORK? BE TOILET TWINNERS! If your work colleagues pull together on a day like World Toilet Day, you’ll soon raise £60 to twin with a household latrine in a poor community. Go out for a meal and give up your dessert. Pledge your pudding here! If you’d like any advice on what to do as a workplace, please contact us for more ideas. If you’re interested in corporate partnership, find out more here. 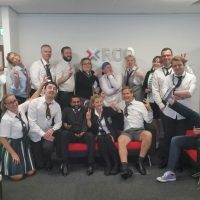 Software consultancy firm ROQ threw themselves into three weeks of fundraising with a ‘back to school’ theme – to twin a school toilet block. Their creative fundraisers included a school uniform day, a GCSE maths test, periodic table bingo and lunchtime games including loo-roll dodgeball.